Across the country, the last two weeks have seen major student protests against racism and austerity. Last spring, The Nation launched its biweekly student movement dispatch. 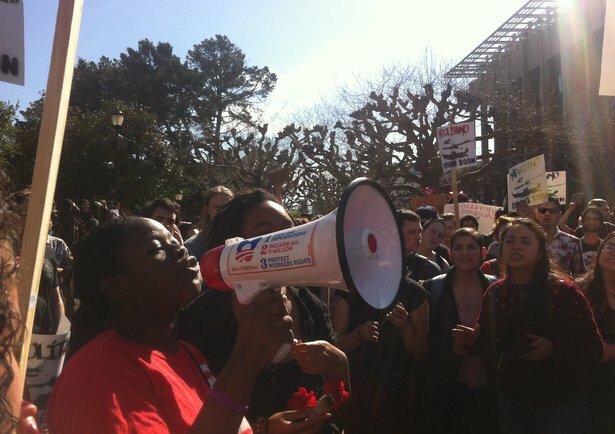 As part of the StudentNation blog, each dispatch hosts first-person updates on youth organizing—from established student unions, to emerging national networks, to ad hoc campaigns that don’t yet have a name. For recent dispatches, check out January 27 and February 10. For an archive of earlier editions, see the New Year’s dispatch. On Thursday, February 13, hundreds of students came out to protest University of California President Janet Napolitano at Berkeley during her “listening and learning” tour. The action, organized by the Students of Color Solidarity Coalition, started with a rally at Sproul Plaza, followed by a campus march to receive students who walked out of a meeting with Napolitano in Sutardja Dai Hall. Meanwhile, a group of eleven students occupied the Blum Center to bring visibility to regent Richard Blum, a central figure in selecting Napolitano and pushing for the privatization of the UC system. The SCSC opposes Napolitano’s appointment as president on the grounds that she oversaw human rights violations as secretary of homeland security—she created the Secure Communities program, which has terrorized, incarcerated and deported almost 2 million migrants—and because of the undemocratic process through which the regents selected her, not to mention her lack of experience in education policy and administration. The events of February 13 have opened cross-university organizing opportunities and brought national attention to the critics of Napolitano’s appointment. On February 19, outraged over the latest evisceration of the academic budget, more than 500 University of North Carolina–Greensboro students, faculty and community members assembled at the center of campus to protest the blatant corporate pandering engaged in by university decision makers. As students work multiple jobs because of rising tuition costs, administrators decided to build a $91 million recreation center—further increasing the cost of attendance. Meanwhile, enrollment continues to drop as a result of the rising costs and declining quality of education. Students’ demands are simple: fund academics and clear out corporate leadership. The next day, student voices forced a board of trustees meeting into adjournment. Students from the rally have agreed to meet weekly to coordinate continuous pressure on university and state officials. On February 12, students from Philadelphia filled the capitol in Harrisburg to protest the state’s prioritization of prison expansion over education. Students from Youth United for Change and the Philadelphia Student Union loaded buses alongside Decarcerate PA and other groups to Harrisburg. I was among a number of speakers who gave testimony about the school-to-prison pipeline, the need for human rights for inmates and the lies of the Department of Corrections. Over the past two years, YUC has won major changes, including the promise of no school closures in 2014 and, with the Campaign for Nonviolent Schools, a discipline matrix for the city’s student conduct code, replacing zero tolerance policies. We are currently organizing to change the MOU between the School District of Philadelphia and the Philadelphia Police Department to decrease the rate of arrests in schools, and are also part of an attendance awareness media campaign in which we talk to young people about staying engaged in schools and avoiding the pipeline. Across the city, students are being arrested, stopped and searched, and treated like they are criminals in and on their way to school. What’s the point of school if you feel like you’re in jail? On February 18, 1,100 faculty members at the University of Illinois–Chicago went on a two-day strike, the first in UIC’s history. After sixteen months of failed negotiations over increased wages, shared governance and increases in hiring, faculty decided to escalate. Students, campus workers and other members of the Campus Worker and Student Coalition marched in solidarity, affirming our collective vision, which includes lowering tuition and paying campus workers a living wage. A petition from United Students Against Sweatshops Local 15 garnered 2,300 signatures from supporters across the region. The cross-issue, intergenerational demonstrations of solidarity represented the deepening and expansion of a movement that is resisting the corporatization of UIC and rethinking how UIC serves the metro region. At the University of California, food service, maintenance, transportation and patient care workers, represented by AFSCME 3299, are gearing up for a five-day strike, their third in a year. The workers will push for a pay raise to meet the rising cost of living in California, safe staffing levels to combat the 20 percent increase in workplace injuries over the past five years, and job security in the face of massive staff reductions. In solidarity with the workers, students are organizing boycotts of dining commons and asking professors to teach off campus and focus their lectures on issues related to campus worker struggles. Throughout the UC system, we have drawn links between the fight for worker rights and the ongoing campaign to force former Secretary of Homeland Security and current UC President Janet Napolitano to resign. In addition to refusing to address the needs of campus workers, Napolitano represents the twin ideologies of privatization and militarization that have threatened the livelihoods of students and workers across the system by creating an atmosphere of fear and inaccessibility for those whom it is intended to serve. In spring 2013, students at New York University started a petition calling on NYU’s Wasserman Career Center to remove postings for unpaid internships that violate Department of Labor guidelines. This was the first petition holding a university accountable for promoting this legally questionable labor practice. Within weeks, the petition garnered more than 1,100 signatures from students, professors and supporters, and gained the attention of Wasserman representatives. As one of the petition organizers, I met with NYU officials over the summer to negotiate changes to NYU’s internship posting policy. This semester, in a landmark move, NYU decided to implement major changes to its internship site, including the creation of a screening process that requires employers to confirm that their internship abides by DOL standards before posting to the career site. We are now working with students at other universities to start similar initiatives at their campuses. In Fall 2013, the ROTC program returned to the City University of New York’s City College, Medgar Evers College, and York College, after being kicked out in 1971. Following recent CUNY struggles against David Petraeus’s teaching appointment, the Morales/Shakur Center’s eviction and a proposed “Policy on Expressive Conduct” to stifle free speech, efforts to re-remove ROTC are intensifying. On February 19, 100 CUNY students, faculty, staff and community members gathered at a Medgar Evers town hall to hear anti-war veterans and audience participants debate pro-ROTC speakers on their predatory aim to “diversify” imperialism at the nation’s largest urban university, whose students are mostly working-class women of color. On February 24, the college’s highest governing body voted by majority to remove ROTC, an important victory against CUNY’s turn towards militarization. On February 22 and 23, ten leaders from Connecticut Students for a DREAM, a statewide network of undocumented students, families and allies, attended United We Dream’s fifth National Congress in Phoenix. Back home in Connecticut, undocumented students are currently fighting for tuition equity. While Governor Malloy signed an in-state tuition bill in 2011, in part due to organizing by C4D, tuition costs still remain a major barrier for those who are undocumented, like me. Under Connecticut statutes, 15 percent of tuition revenue must go back to students in the form of need-based aid. Even though undocumented students pay standard tuition, they do not have access to state or federal aid, which is calculated using the FAFSA, which they cannot fill out. The state’s Board of Regents has the power to fix this by expanding the ways that need is calculated. This spring, our Afford to Dream campaign aims to make this change happen. On the night of February 17, just days before the final Teach for America application deadline, Students United for Public Education hosted a #ResistTFA twitter chat as part of our Students Resisting Teach for America campaign. The goal was to highlight critical views and elevate the conversation around TFA. Within an hour, #ResistTFA was the #1 trending topic in America and it stayed there throughout the night. Hundreds of students, teachers, parents and TFA alumni shared opinions, experiences and articles about TFA and discussed their reasons for resisting—from TFA’s inadequate five-week training, to its connection with corporate education reform, to proposals for better models than TFA. This spring, we will be continuing our campaign on various campuses by holding teach-ins and panels. Concerned that the unique struggles of organizing in the South are overlooked by the majority of movement spaces, students at the University of Richmond have established a partnership between the university’s Office of Common Ground, Q-Community, Student Alliance for Sexual Diversity, Southerners On New Ground and ROSMY to offer queer youth leaders across the South a new opportunity to connect and build power. The result, the March 22 Queer Summit, will be a gathering dedicated to queer youth movement-building, skill-sharing and best-practices development, led by those under 25. Of particular focus are ways that power structures continue to trivialize our youth experiences; the Q-Summit will build power through DIY self-care workshops, caucuses among traditionally marginalized communities within our queer family, and leveraging collective voice within universities, religious denominations, academic disciplines and communities. On February 7, more than thirty students from across Vermont gathered for the first ever Vermont Student Power Conference and voted to combine separate campus organizations into one unified organization, the Vermont Student Union. Devoted to a democratic system that works to advocate for both student and workers’ rights on all campuses, the VSU is fighting for transparency of administrative spending, support for a living wage and benefits for all Vermonters and more student voice in university decision making. This spring, the VSU is launching a “Meet Us Halfway” campaign, directed to state legislators who are ignoring crucial legislation that would require the state to fund fifty percent or more of the overall Vermont State College budget. They are currently supporting only 14 percent of the overall budget; the rest comes from student tuition. 13. Will Cal State Get Away With Unprecedented Fee Hikes? At Sonoma State University, San Diego State University, Cal State–Fullerton and Cal State–Dominguez Hills, students are fighting mandatory, campus-based “Student Success Fee” hikes of up to 77 percent. This new breed of fee hikes utilizes a divide-and-hike tactic—introducing fees campus by campus, obscuring what is in reality a systemwide hike. Administrators sell the fees with promises of additional classes and faculty hires, omitting that most financial aid packages don’t cover this classification of fees and pose an extra financial burden on students. They also fail to mention that the current student forums are only one method allowed for implementing them—with the alternate being a democratic referendum vote by the student body. In light of successful, statewide student mobilizations against fee increases less than two years ago, administrators fear that students could vote them down. On February 19, students at Sonoma State successfully overturned them, with the other campuses planning coordinated actions for March. 14. What's Next for CSULA’s Ethnic Studies?